Infant pillow support comes in a variety of forms, some of which are beneficial while others go against the most recent pediatric advice. From Boppy to Zaky, there are plenty of pillow items that will assist you through those early days of motherhood. There are many different types of pillows available, but proper products all share a few common features. First, an acceptable infant pillow should be firm. Any soft spots where a baby can "sink" into the pillow can be hazardous to the health of a little one. Pick out a pillow that is firm enough to be safe while still being comfortable enough for baby to spend time with it. Infant pillow support should also come in a shape that is designed for a newborn through toddler. A regular pillow shape is not appropriate for a small baby, and you will find many infant pillows are horseshoe shaped or designed in a similar curvature. This way baby can either be laid down inside the pillow for daily routines such as a relaxing story time, or mom can use it for support during feeding and cuddles. Below are a few of the most popular brands of infant support pillows in various shapes, from simple concepts to obscure inventions. 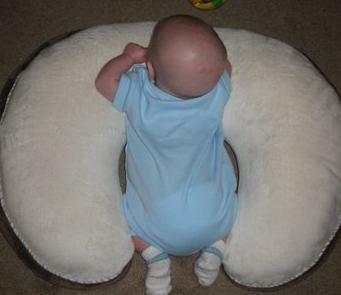 The Boppy is one of today's leading infant support pillows. Its large size and horseshoe shape allows plenty of versatility for both caretaker and baby. The Boppy can be used for feeding time, as it easily fits around most female waists to place baby at the right level for nursing. It is also compatible with bottle feeding as you can again prop baby up in a variety of positions for easy meal times. The Boppy can also be used for tummy time. Flip baby into the center with his arms facing outward so he can practice supporting himself and strengthening his head and neck muscles. Finally, the Boppy can be used as support while learning to sit up. This innovative product features the important firmness factor that provides baby with the opportunity to practice important developmental skills that lead to the most cherished of milestones. Boppys come in a variety of colors and covers, so you can match any nursery or home décor. Over 50 different colors are available, from classic to absolutely zany, so you can switch out your Boppy look to fit your current maternal mood. Almost all covers feature two different fabrics, so the front of your Boppy has a completely different personality than the back. The Boppy is affordable, especially when you consider what versatile use you will get out of it. It's available for purchase online. The Zaky seems like a strange idea, as it is literally a pair of large hands made out of micro fleece and polyester, but you can't deny the positive effects it has had on countless newborns all over the world. Featured on such shows as Rachael Ray and FOX News, parents have tested this product, and it is safe enough to be used even in a hospital nursery. The Zaky infant pillow support works as a surrogate pair of comforting hands when mom can't be with her little one. Perhaps you have a preemie in the NICU or you need assistance getting your baby down for a nap during the day - whatever the reason, the Zaky does the trick. You can purchase one Zaky (for older babies) or two (for little ones) through online stores such as Nurtured by Design. Don't let the ridiculous look of the pillows fool you - they can do wonders when it comes to soothing an infant. Many other forms of infant pillow support are available, but always check with your pediatrician before placing your infant in any product. Some babies, especially preemies, should not be placed into wedges or any other sleep positioning device. The only way to know for certain what's appropriate for your little one is to consult your medical doctor.